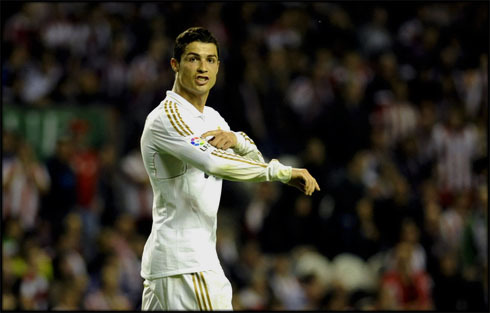 ﻿ Athletic Bilbao 0-3 Real Madrid. Champions with style in San Mamés! 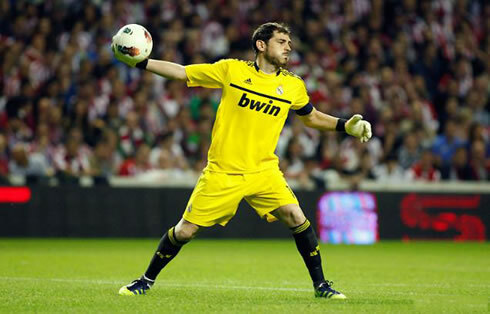 02.05.2012 » Athletic Bilbao 0-3 Real Madrid. Champions with style in San Mamés! The Merengues confirmed the Spanish League title in San Mamés last night, after beating Athletic Bilbao by an impressive 0-3 result. Cristiano Ronaldo ended up missing a penalty-kick early in the game, but redeemed himself later on, with an assist to Mesut Ozil for the 2nd goal and a nice header that extended Real Madrid lead to 0-3. The Portuguese forward has now 44 goals in La Liga, 2 goals less than Lionel Messi, who scored an hat-trick against Malaga this Wednesday and reached the impressive mark of 46 goals in the league. The wait is finally over as Real Madrid became La Liga 2011/2012 champions, after beating Athletic Bilbao in San Mamés, by 0-3! Higuaín, Ozil and Cristiano Ronaldo added their names to the scoresheet in this game and helped assuring that the 3 points and the title weren't going to slip away, against one of the most strongest sides in the Spanish League. With two games left in the competition, Real Madrid retained their 7 points lead over Barcelona, which means that a remontada is mathematically impossible from now on. This is the 32th La Liga title in the Merengues history and it ends precisely a 3-years hegemony from Pep Guardiola's Barcelona. There certainly were a few hiccups on Real Madrid's path to win this La Liga title, but at the same time, this achievement has to be seen as truly remarkable if we have in mind how difficult it was to finally end Barcelona's hegemony in Spain. With an impressive record of 36 games, 30 wins, 4 draws and 2 losses, Real Madrid already reached 94 points in the league standings, having scored 115 goals and conceded 30. The numbers speak form themselves as the Merengues are close to end one of the most regular seasons they've ever had in their history. Critics? There will always be plenty, specially when the man behind this project goes by the name of José Mourinho. The game in San Mamés wasn't exactly a critical one, since it could have been regarded as the first of three matchpoints coming ahead. However, Real Madrid knew that a victory this Wednesday night would assure them immediatly the title of Spanish champions and the players really put on a show in San Mamés, against a side that is widely considered as one of the most fierceful teams in Europe. 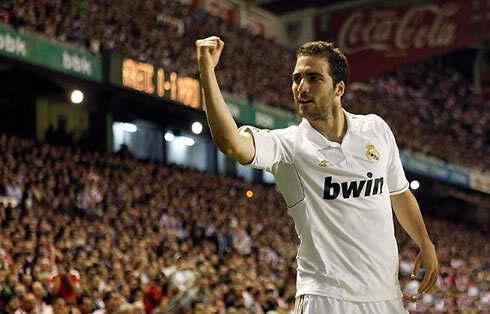 A 0-3 victory allowed Real Madrid to clinch La Liga 2011/12, with still two games left in this season's schedule. With 16 minutes on the clock, Real Madrid showed a good attacking combination between Cristiano Ronaldo, Ozil and Higuaín, which the Argentinian brilliantly finished with a powerful and accurate shot. The Merengues had taken the lead and wouldn't drop it anymore in the game. Ronaldo was still visibily upset for having missed the penalty-kick just minutes before, but Real Madrid didn't slow down and managed to get that always important early opener. Less than 5 minutes later, the second goal arrived and once again, Cristiano Ronaldo gave a decisive contribute. After a good pass from Xabi Alonso, CR7 was left with plenty of room to explore on the right wing and made a great low cross to the far post. His pass met Mesut Ozil completely unmarked and with the simple task of tapping the ball in. The roles seemed to have been switched with Ronaldo assisting Ozil, for the German's second goal in La Liga this season. Two goals advantage for Real Madrid and most of the fans had already started anticipating the long awaited party and celebrations. The game kept being played intensely over the first half, but there wasn't any other relevant incident until the break. The second half started with Real Madrid very focused in the game, which actually paid off close to the 50th minute. Xabi Alonso took a corner kick on the team's left attacking side and Cristiano Ronaldo jumped unmarked and already very close to the goal line, making his 44th of the season in La Liga and extending the lead to 3 goals without response. Real Madrid proved once more why they outplayed every single team in Spain this year and increased La Liga's all-time record for goals scored in a season, with 115 goals in 36 games and still 2 matches left to be played (against Granada and Mallorca). On a final note, the San Mamés crowd had a very hostile reaction to Cristiano Ronaldo, which led the Portuguese player to also respond in a few occasions. Starting with the shameful and provoking chants of "That Portuguese, son of a **** he is...", or simply throwing lighters and other objects to the field, it has to be said that the crowd really disappointed us. 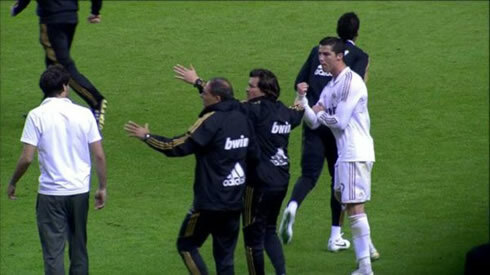 That being said, Ronaldo probably should have known better, but he ended up losing a bit of his emotional control, by responding to some of those provocations, first by pointing to Real Madrid and La Liga's badge and later on, just after the final whistle, by reacting to Javi Martínez who decided to ran into him to exchange a few words. This time, Cristiano Ronaldo had a typical Portuguese gesture called "Manguito", which basically means he told Javi Martínez to "shove it" and deal with it. 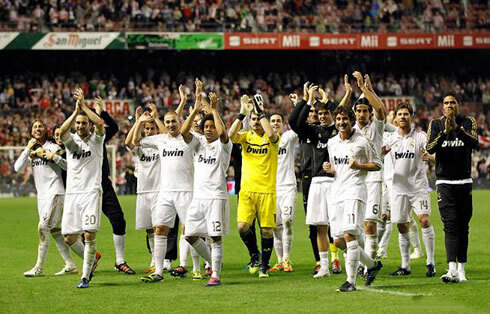 Real Madrid next game will be for La Liga, against Granada, this next Saturday (05-05-2012). You can watch Juventus live stream, Granada vs Real Madrid, Barcelona vs Espanyol, Liverpool vs Chelsea and Arsenal vs Norwich, all from our football live streams section. Cristiano Ronaldo will probably be on a starter when Real Madrid visits Granada.